In the immediate aftermath of last year’s school shooting in Newtown, Connecticut, majorities of Americans favored several proposals to tighten rules on who could buy guns and what types of guns and ammunition they could buy, according to a Pew Research Center survey. But in the year since Newtown, no new gun-control measures have passed Congress, and most new state laws have loosened, rather than tightened, gun restrictions. The chart above, compiled by The New York Times, summarizes 109 state-level gun statutes enacted since Newtown. The accompanying interactive provides a state-by-state rundown on legislative activity regarding ten different categories of laws (some statutes cover more than one category). 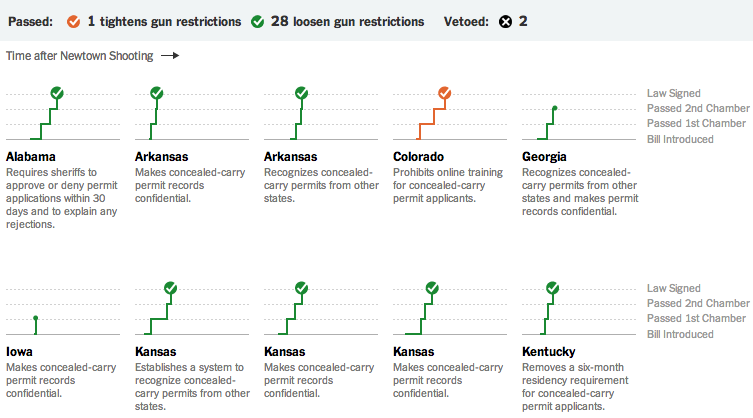 For example, all but one of the 29 new state laws addressing gun permits (partially shown in the screen capture above) made those rules looser; all 22 laws addressing when guns can be carried in public loosened restrictions. On the other side of the debate, 15 of 17 laws sought to make it harder for mentally ill people to buy guns; 12 of 14 laws tightened rather than loosened rules regarding background checks.